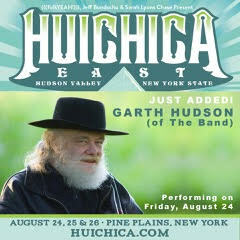 Garth Hudson is a multi-instrumentalist and co-founder of the legendary and internationally influential rock group THE BAND. Martin Scorcese filmed them with a few well-known friends in The Last Waltz. Garth was a principal architect of the group’s unique sound. His mastery of the Lowrey organ led to his being called “the most brilliant organist in rock and roll” by Time magazine. He will be closing out Friday night at Huichica Music Festival. Pretty Archie now on Curve Music!